By this point, it must be pretty well-known how much we both enjoy going to Greenleaf Gourmet Chopshop whether for a quick bite or to get mouths full of their on-tap Maine Root sodas (Duc is partial to the ginger brew of course). When they opened at SOCO, we were ecstatic because it brought the restaurant closer to us and in a location we frequent often. In addition to the sodas, I've always been a fan of their light and refreshing cocktails, particularly the Lavender Lemonade that seems to be quite popular with others. 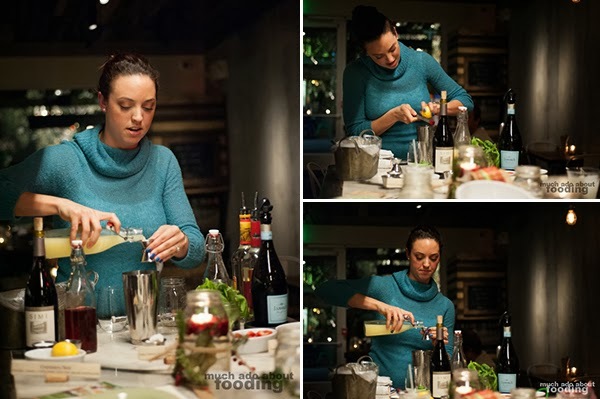 So of course, upon invitation to a release of their cocktail menu with a fun demonstration in store, we readily accepted to see what was shaking up the place. They have actually had this list ready since late October but the roll-out has been gradual as they start to publicize bit by bit. With a price set at just $9 a cocktail (and half off during weeklong Happy Hours! ), Greenleaf's debut of their libations puts them in a good spot with the clientele that visit SOCO and the OC Mix. We viewed a few of them (below) but there are certainly more such as the Cucumber Mojito, Blood Orange Punch, and Agave Nectar Margarita. Bar Manager Laurie graciously regaled us with stories of her inspiration for the cocktails as she poured each one, explaining step by step the methods. 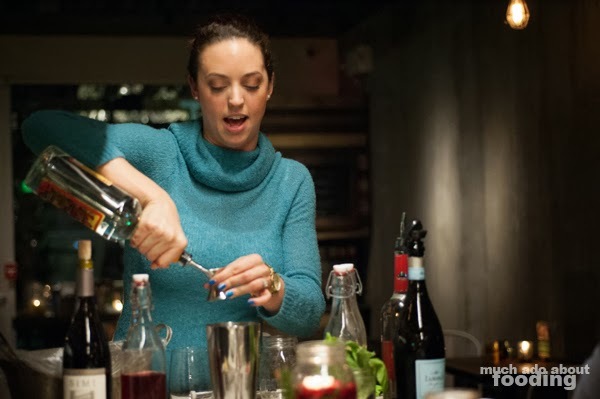 Enamored with the wave of recent mixologists flooding the restaurant scene, Laurie has been experimenting with various cocktails for some time now and managed to curate some lesser known (but more Greenleaf-like) spirits for them. As we listened and watched, we munched on some items from their Seasonal Snacks menu which is always changing. 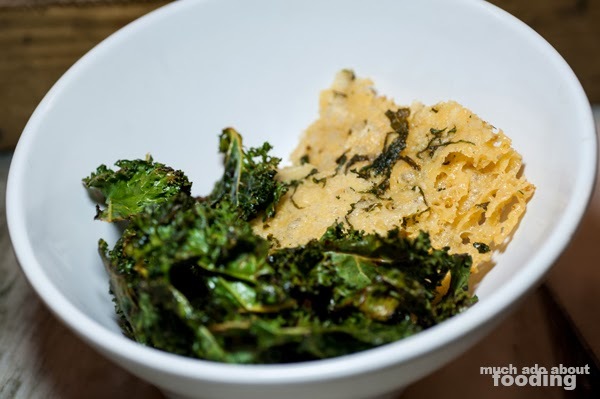 For that night, we started with community bowls of their Kale Chips (kale tossed in olive oil and lemon juice with kosher salt, baked) and Parmesan Crisps (Parmesan and season blend, baked) - two bites that were well-seasoned and delicious on their own but even more magical when had together. If you ever have problems convincing people to try kale chips, they should try these! The drinks made were the Strawberry Fresca (Petrov Reserve, triple sec, lemon juice, muddled strawberry and orange, pomegranate juice, Prosecco float) and Ginger Sparkler (Petrov Reserve, triple sec, lemon juice, cubed sugar, muddled ginger zest, Prosecco float). 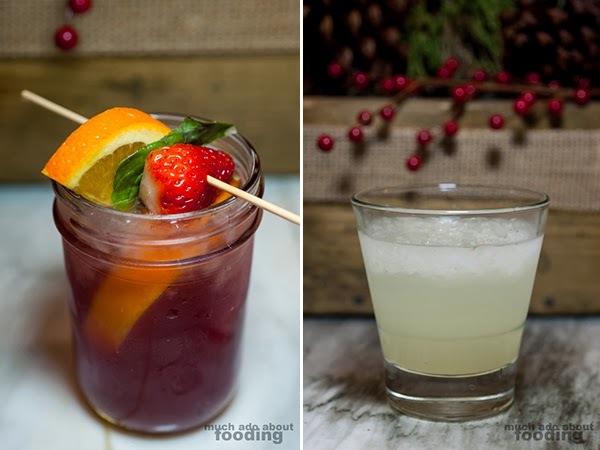 Our first demonstration of the evening was for the Strawberry Fresca, an easy segue from the warmer season to cool fall and winter (or can also be seen as the representation of a southern Californian winter!). 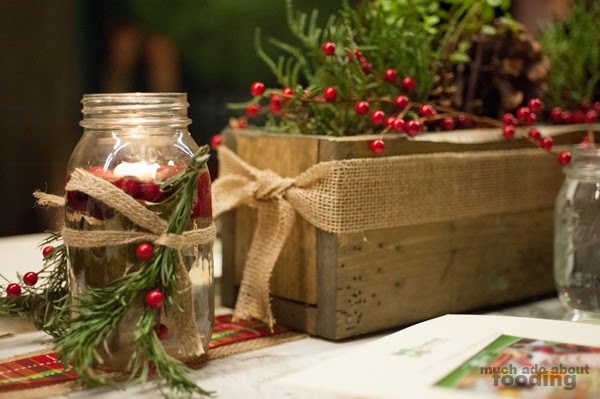 It was vibrant and bright with citrus and fresh herbs to open your palate and wake you up. This was made from a combination of two orange peels, 1/2 oz lemon juice, 2 oz chopped berries, basil leaves, fresh ice water, 1 oz pomegranate juice, 2 oz Petrov Reserve, 1/2 oz triple sec, and a float of Prosecco on top. The fruits and herbs were muddled only about 3-4 times (Laurie warned us about over-muddling), shaken with not too much ice, and garnished with a basil leaf, orange slice, and strawberry. For the Ginger Sparkler (Duc's favorite for the evening of the three tried), it was a simple mix of two sugar cubes, ginger zest, 2 1/2 oz Petrov Reserve, 1/2 oz lemon juice, and 1/2 oz triple sec, garnished with a fresh ginger peel. Tasty and naturally spicy, this was easily a drink you'd need to love ginger for. To steel ourselves against the alcoholic content of three cocktails (though smaller than normal sizes), we all partook in signature bites from their menu. Admittedly, considering the different spirits they decided to use in the cocktails, there was hardly enough alcohol to make us keel over but we won't say no to Greenleaf's eats. If you don't know, they have a fun seasonal dish called the Grilled Deliciousness which rotates in ingredients every few months. 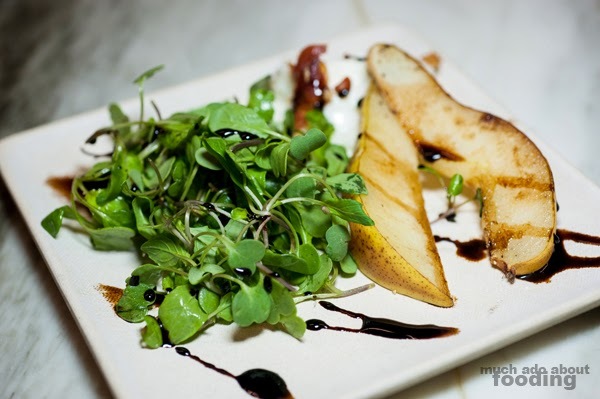 This time ours came with grilled pear, micro arugula, burrata, and crispy prosciutto with a balsamic reduction. The festive drink for this round was their Cranberry Noir (Leese Fitch Pinot Noir, cranberry juice, vanilla extract, lemon zest, sea salt, sparkling soda) made of 2.5 oz Pinot Noir, 1 lemon's zest, 1/2 oz lemon juice, 1 tsp vanilla extract, cranberry juice, and a garnish of a pinch of sea salt and lemon zest (typically so but ours the evening had an orange slice). 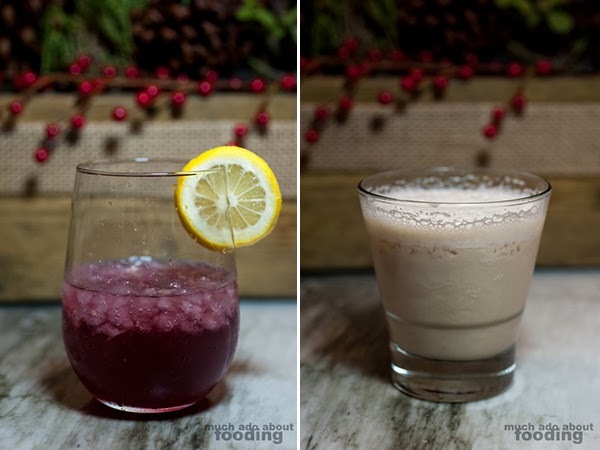 This was easily the weightiest of the three cocktails for the evening and the most festive for the holiday season. Elegant in a stemless tumbler, the Cranberry Noir sits somewhere between a classy dinner night out and a warm, by-the-fireplace night in. Vanilla extract itself is a powerful scent so the addition of it to the fray lent to a unique nose on the drink which was countered by zest and sparkling soda. You see another drink pictured in this post though. After looking at the long cocktail menu, we had questions overall about some of the more uncommon spirits including a rum wine but the one that piqued my interest the most was their interpretation of a White Russian - the Seaworthy Russian (Petrov Reserve, Seaworth cold brew coffee, coconut simple syrup, half and half). The coconut simple syrup drew me in, and the use of cold brew coffee (a fun trend we've been noticing among coffee lovers) begged us to have a sip. While all of the other cocktails tried that evening were tasty, this became my favorite upon first sniff and confirmed with a sip. Creamy and warmth-inducing, it embodies more of what I prefer during the holiday season - being wrapped up in a blanket in the comfort of my home. It's a drink to come back often for during the colder months! 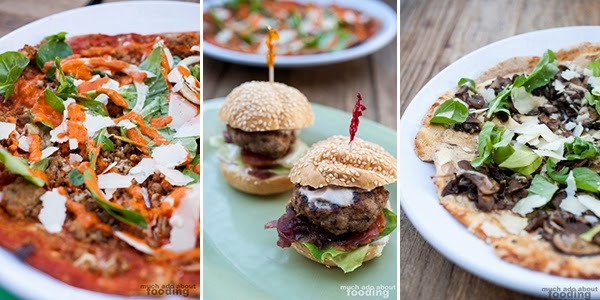 As for the remaining food in the cycle for the event, we didn't snag pictures but had ones from previous visits (which is what is pictured above) of their Spicy Turkey Sausage & Fennel Pizza (on whole wheat tortilla - Mozzarella, spicy housemade romesco sauce, turkey sausage, arugula, fennel, and shaved Pecorino Romano), Turkey Sliders (on mini sesame buns - mini turkey patty, caramelized red onions, butter lettuce, roasted tomato, and fresh pomegrante/cranberry aioli), Meatball & Toast (turkey meatballs in spicy tomato sauce topped with fresh baby Mozzarella and basil), and Wild Mushrooms & Truffle Oil Pizza (on whole wheat tortilla - three cheese blend, wild mushrooms, arugula, truffle oil, and shaved Pecorino Romano). If you're looking for some healthful but still savory dishes, Greenleaf has you covered. Our thanks go out to Laurie for sharing her time and knowledge with us, the staff for the food, and Devon & Rubina for inviting us out. I've got my eyes on that Seaworthy Russian!